If you're interested in our history, you can see all the events in which we've taken part over the years. Some of them will even have picture galleries and blog entries associated with them! April 30 10:30-16:00 Dance out at the Long Itchington Beer Festival, Long Itchington, Warwickshire. May 1 13:30-14:30 Appearing at the Southam Lions Fete, in the car park of The Bowling Green Pub, Coventry Street, Southam, Warwickshire. July 8 10:00-17:00 Annual mystery cyclobooze. The route, starting in Harbury was Biblio's, The Blue Lias, Long Itchington; The Folly, Napton; The Shoulder of Mutton, Grandborough; The Boat, Birdingbury Wharf; Harbury. 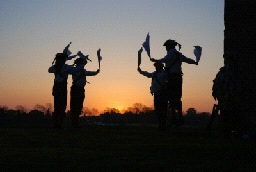 May 11 19:45-21:30 Dancing at the Red Lion in North End (near Burton Dassett Hills) CV47 2TJ. May 25 19:45-21:30 Dancing at the Somerville Arms, 4 Campion Terrace, Leamington Spa, CV32 4SX. July 23 10:00-17:00 Warwick Folk Festival, CV34 6PP. We're dancing on Saturday, but will be there from Thursday evening and all weekend enjoying the music, dancing and fun! July 25 10:00-17:00 Warwick Folk Festival, CV34 6PP. We're dancing on Saturday, but will be there from Thursday evening and all weekend enjoying the music, dancing and fun! December 31 19:15-24:00 Interval spot at the New Year's Eve Contra Dance with band Vertical Expression and callers Bob Morgan and Jake Wood, Harbury Village Hall, CV33 9HG. Tickets from WeGot Tickets. Bring your own drinks, and food to share if you'd like to eat before dancing. June 29 9:45 am for 10:00am Cyclobooze mystery cycle ride, starting from Draycote Water Car park. 2012 was our 25th Birthday. 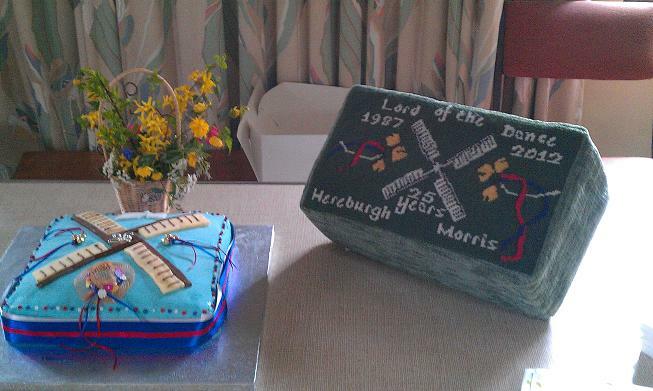 Hereburgh's birthday is on 8th April which, in 2012, fell on Easter Sunday so we invited the congregation of our local church, All Saints, Harbury, to share our celebration cake on this very special day. The hassock was made as part of the church's project to replace worn ones which has been running for several years. This one was finished just in time for our birthday and can now be seen in the church. May 19 10:30 Hereburgh 25th Anniversary Day of Dance Leamington Spa, Warwick Castle, Lowsonford & Harbury. July 3 10:00 Temperance Cycle Ride ('Tour de Dance') - a mystery tour starting from Lapworth. The Talbot, Rushmore Street, Leamington Spa (CV31 1JA). Punch Bowl then Rose & Crown. 22/05/1994 171 Newbold Comyn Arms, with Plum Jerkum, Earlsdon etc.